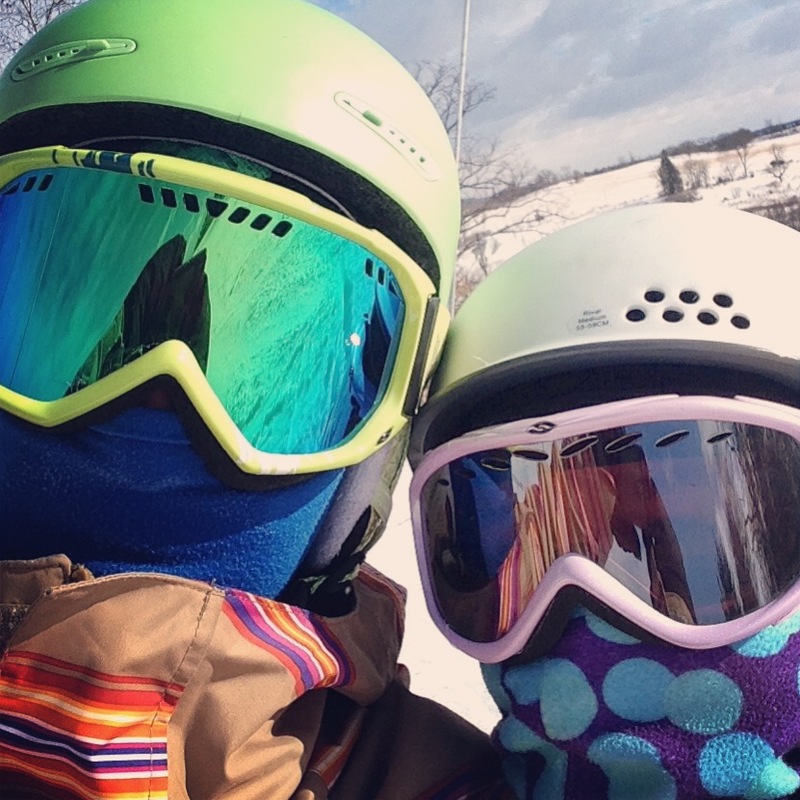 A Snowboarding we will go, A Snowboarding we will go…. Today was the fourth Sunday of Women’s College at Afton. Women’s College is instruction for women, by women. Like abilities are grouped and away we go. I thought I was going to walk in and rock it. Beginner – to me – means never having had any chance to snowboard. Not having gone through Women’s College before and returning….sort of like those kids blowing the curve in calculus by taking calc 1 at university when they completed the course in high school. I was schooled immediately. And let me tell you – I sucked. However, being the struggling student has its advantages – namely I basically get a three-hour private lesson. And Instructor J is amazing – she’s patient – kind – tolerant – not easily frustrated – and an excellent teacher. She was teamed with Instructor P to help a couple of us along. She too is wonderful. For whatever reason, I am finally able to put small things together and make it down the hill without a million and a half stops and falls. Evil Fear likes to mess with my brain and I’m learning to stomp the crap out of my Evil Fear and make it take a hike….of a cliff….into the ocean…with riptides. I admitted one of my biggest fears today – smooshing a little one. There are all these tiny people skiing on the hills we are snowboarding on. I weigh 4 or 5 times as much as them and I’m terrified of landing on one. Instructors J and P finally got it through my head they will move. They will get out of my way – or fall down. It’s all good. We walked out to one area – the Meadows – and worked there. It was all good. Then I got so freaking nervous it was paralyzing. My classmate smacked her head getting off the chair lift. Next we saw someone immediately after they had a terrible fall off the jumps – broken bones and bloody snow. And I saw an ambulance. Remember what those still do to me? Then we saw the Medic People on the snowmobile pulling the gurney behind on the snow. Made it through my Evil Fear…..I kept on keeping on. I may have been tired and scared and made a number of mistakes….but I made it to the end of the trek we took from the Meadows back to the Alps. I do okay going down a hill. If I get stuck it takes me a bit to get over my Evil Fear and tell it to shut the front door but eventually I get up and get moving. I even started learning something totally new today that I will practice this week – 360 Flat Turns – I think that’s what they’re called. I’ve got 180 degrees of it down and sometimes a little more before I fall on my face ….. but I’ll get it. how to stand up on a hill…while strapped onto a snowboard…(which is slippery and requires balance to a degree)…. S turns…mine sort of look like Z’s – still working on that…. I can do this. I will continue to learn and improve. I can do this. I AM doing this. Eldest Female Spawn and I having some girl time…..
EJ out – to use my new-found confidence to solve the next problem I find. Okay – I’m asking a lot. You can either click on this link – Circle of Mom’s Top 25 – or click on the Circle of Moms icon on the upper right, scroll down and find Evil Joy Speaks, and click on the thumb. You can do this daily, however it must be 24 hours from the last time you voted. And here’s the a lot…after that – if you’d come back to Evil Joy Speaks and click on the juggling lady – you’ll cast a vote just by doing that – nothing else required – for me at Top Mommy Blogs.